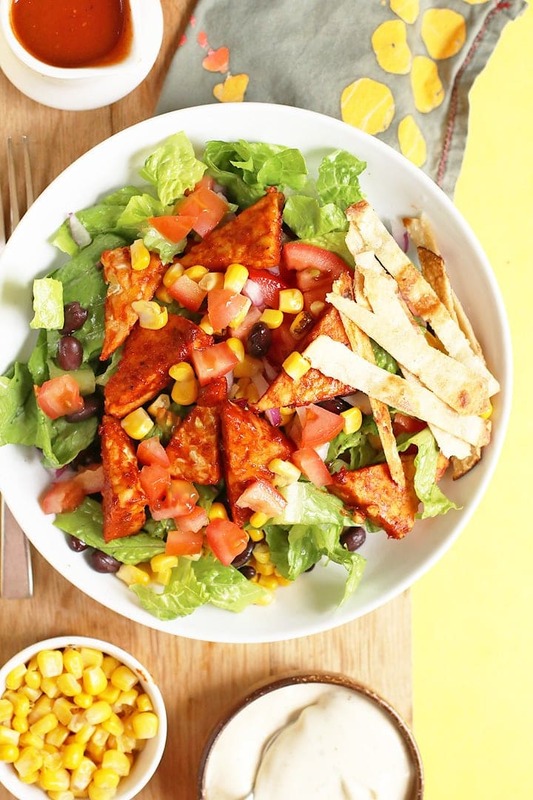 This Southwest BBQ Tempeh Salad is made with baked Tempeh, fresh vegetables, and homemade vegan ranch dressing for a delicious and refreshing summer salad. Prepare the homemade BBQ Sauce and refrigerate until ready to use. Cut the tempeh through the middle then cut into 1" squares. Slice diagonal to create triangles. Place the tempeh in a shallow dish and cover with about ½ cup BBQ sauce. Place in refrigerator and marinade for 1 hour. Once marinaded, place tempeh on a parchment-lined baking sheet in a single layer and brush with additional BBQ sauce. Preheat the oven to 425 degrees F. Bake tempeh for about 25 minutes, flipping half way through. Remove from oven and allow tempeh to cool for 10 minutes. Assemble the salad by dividing the romaine, tomatoes, corn, black beans, and onions between 4 plates. Top with BBQ tempeh, homemade ranch, and the remaining BBQ sauce.